When we think of the little black dress, we assume it will be of the cocktail dress variety. However, a basic black dress need not be fancy to be functional for a multitude of occasions. I look for dresses that are not overly clingy, have quality fabric and construction, are knee length to midi length and reasonably priced. Today, I am sharing two of the favorite black dresses in my wardrobe. Above, I am wearing a black cashmere sweater dress. Our winters are cold here in Chicago, and when I need to dress up a bit more I still like to be warm. I’ve added a scarf for further warmth and style and paired it with black tights and knee high dress boots. 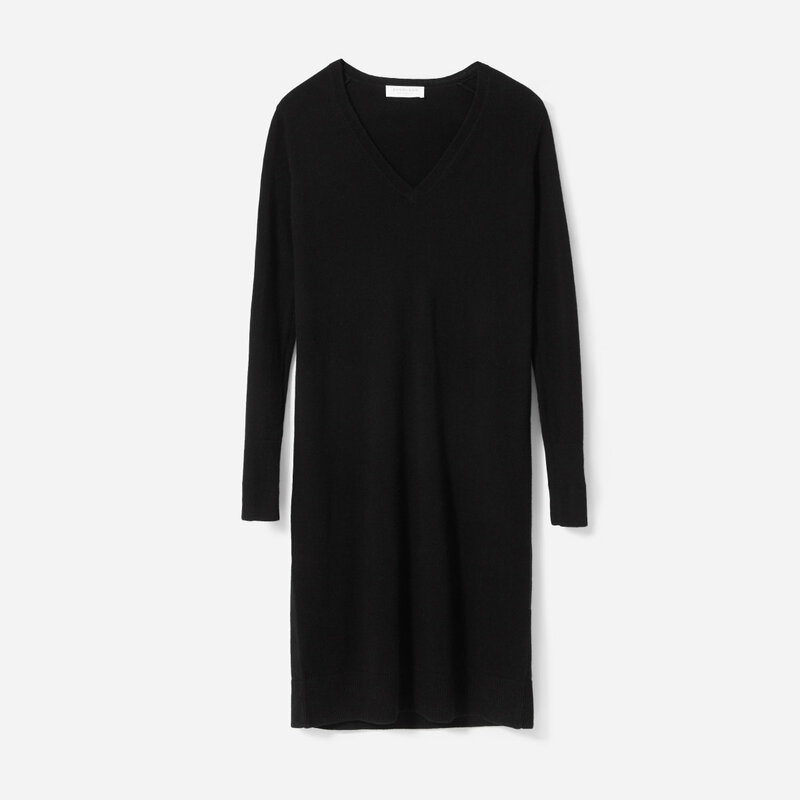 The cashmere dress I am wearing is by Everlane. I love the cashmere from this brand! This dress skims the body, doesn’t cling, is soft, has a flattering v-neck, and a perfect slightly below knee length. I envision a multitude of ways to wear it. Throw on a jean jacket for a casual look. Wear with booties and bare legs in warmer weather. Dress it up with jewelry and heels. So many options! In this photo, taken last summer, I am wearing a different simple black dress. I have it styled casually with a jean jacket, and sandals. I am wearing this Eileen Fischer tank dress. I can’t say enough about how great this dress is! It’s a polished jersey knit that truly flows over the body. I’ve worn it with both flip flops and out to dinner in a nice restaurant with statement jewelry. The midi length is flattering with flat sandals or heels. Add a jean jacket as I have for casual wear or a beautiful wrap for evening. Another bonus, it’s great for travel – no wrinkles. I still love a fabulous black cocktail dress, but sometimes we need something that goes the distance for lots of occasions. I hope you are inspired to shop for “simple black dresses” and not just “little black dresses”!